Protests across Brazil have reached a head as the world’s sporting public turns its gaze to the first matches of the 2013 Confederations Cup, an event designed to ‘test’ Brazil’s readiness to host the World Cup next year. What started out as a protest against a 20-cent rise in transport fees has tapped into a deeper malaise that a large percentage of the Brazilian public has towards the direction of their growing economy. A bus ride in São Paulo will now set you back R$3.20, or around 95p, in a city where the minimum wage is R$678, about £200 per month, and where discounted monthly travelcards don’t exist. Having suffered under a military dictatorship from 1964 to 1985, civil society has been further enraged by the shocking scenes of the police’s heavy-handed response to the protests. Dissatisfaction over how out of touch Brazil’s political class are has been simmering for some time. Whilst living standards are squeezed by low wages and inflation, Brazilian politicians award themselves salaries upwards of R$20,000 (£5,924) per month, plus benefits. Trust in politicians is almost non-existent due to a culture of cronyism and bungs. Great swathes of the populace are exasperated that the government can spend upwards of R$31 billion (around £9 billion) on the World Cup, whilst the country’s infrastructure, education, health and security suffer from a crippling lack of investment. Construction of the World Cup stadiums has run into the uniquely Brazilian combination of corruption and stifling bureaucracy, meaning stadiums built on the public dime are delayed, over budget and more expensive than corresponding venues at recent sporting events. The question remains as to what will happen to the stadiums after 2014. Average attendances in the top division of Brazilian football are around 13,000. The cities of Manaus, Cuiabá and Brasília have one team in the top three divisions between them (América-AM) yet have built stadiums with capacities of 40,000 plus. 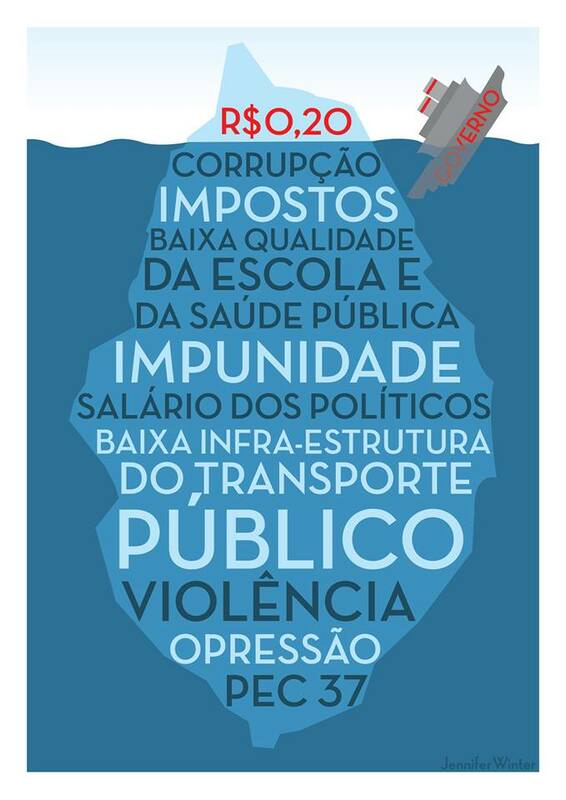 In this context, the rise in transport fares can be seen as the straw that broke the camel’s back – “a gota d’água” in Portuguese – leading to Brazilians taking to the streets in protest across the country, as well as worldwide. The increase being announced a few weeks back has meant the Confederations Cup games currently taking place have been just one focus of the demonstrations. Protests at the stadiums in Brasília and Rio de Janeiro have been met with tear gas, pepper spray and baton charges, and Sepp Blatter (FIFA president) and Dilma Rousseff (Brazilian president) were booed before the opening game began. Brazilian communities around the world are calling for demonstrations in solidarity with the Brazilian protestors and against police repression. London’s event will take place from 5pm onwards on Tuesday 18 June in Trafalgar Square, the streets surrounding the Brazilian Consulate considered too narrow to hold a significant number of people safely. International support is greatly appreciated. More information on the reasons for the Brazilian protests can be found here: http://www.youtube.com/watch?v=AIBYEXLGdSg. The London demonstration takes place on Tuesday 18 June, from 5pm. As of 18th June, the location has been updated to Old Palace Yard, between Parliament and Westminster Abbey. For more information, please see: https://www.facebook.com/events/183382041822867. Sam Katterfield studied BA Spanish, Portuguese and Latin American Studies at the University of Manchester and previously spent time living and working in Brazil and Argentina. Im braziliam, It ir good for us to have support around the world…cause we are fighting hard, and the numbers of people here in the streets is increasing so we can make a difference, but the politicians wont help us, and the most of the population are gathering not just to protest for the high prices on publical transport…but the hole situation that is around it, the politiccs, the abuses of the lower class and mostely of it all he violence that’s been made from the cops against the PECEFIST moviments, we try to speek and they wont listen, now the people are getting tiered from all that we’ve been through till now…and raised up…so please show the world our deficience. Ever since Brazil was discovered the social unequality took its place. For decades the majority of us has been suffering and always on silence as we were culturally thought by our fathers . Our representants from the government dont take their places seriously , leaving inportant issues without care like transport, road conditions, health, security and in especial education.the last one is porposely forgotten. Today (more than 20 years after the last movement), Some Brazilians decided to wake up and hopefully more of us will join against the corrupt goverment to get our civil rights. Hello Everyone, Check it out my NEW VIDEO “Brazil Protests in London UK – 18th June 2013”. Olá a todos, Confira o meu vídeo novo “Protestos Brasil em Londres Reino Unido – 18 de Junho de 2013”.